Please scroll down to see full conversion list. We are now proud to announce that our New Colour ranges are with us for the start of 2019. Many new colours and textures have been sourced to add to our already long list of Upholstery, to make your bespoke built Camper even more funky that before. Also we have added a new slick sink/hob unit in Black, giving more choice to the kitchen area, as well as a new Work Top surface. Teahupoo’s new Interior Unit is now with us, even better than before. No pointed edges, all curves, bull-nosed finished from the cupboard ends to inside the doors. New fittings and deeper lacquered finish. All of our campervans can be individually designed to your specific requirements. 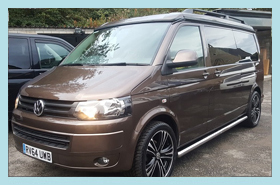 We offer a range of finishes and you can be involved in the whole experience of designing and building your campervan. Our highly experienced team will guide you through every step of the process ensuring you receive a professional and friendly service. We also offer finance packages which are affordable and competitive. 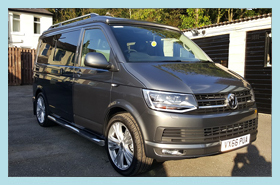 We have a varied selection of used Vans – all VW T5/T6 models – with varied specifications. If we do not have a vehicle in stock to your meet your needs, we will attempt to source and design a vehicle for you as quickly as possible. All vehicles carry a current MOT certificate, are checked in our specialist workshops and there are gas safety certificates for all vehicles. Please note that viewings are strictly on an appointment only basis so please ensure that you book your appointment prior to coming to our forecourt. We also offer custom build packages – you can bring your own van to us and we will convert to your specification. To find out more about any of our sales packages please call our call centre on 0844 854 8842.